Can't believe Roscommon didn't beat a Tyrone side in complete disarray. But for Morgan's sly knee and silly reaction by Harney Tyrone would have lost. Roscommon i might add were the ones in disarray. Well beaten in all super 8 matches,manager walked and have lost a number of starters due to travel,retirement and injury. Result of the day was that away win for Galway, Kevin Walsh has played a blinder to the media about the injury crisis when about 9 of today's team will likely start come championship time and regardless what players Galway are missing they stick to their system which has produced just two league defeats in two years and both of those defeats was against Dublin. I think it'll be more like 6 or 7 will be starting but it's hard to tell this far out with form and injury playing a large part. Lavelle, Kerin, Bradshaw (might hang in there for another year), Heaney, Flynn, Walsh. Maybe Kelly. Maybe Cooke. But they could as easily be on the bench. I don't think Duggan will be starting. Or O'Donnell. If everyone was available. On the plus side the Daly's made a surprise come back today having not even played for NUIG for a month. Walsh is full of surprises, keeps all guessing including his own supporters. Well that was a bolx at the end today as the blind Ulster officials combined to ensure dirt by Morgan went unpunished while a naive reaction by our man resulted in the free being overturned. A heroic battling backs to the wall performance by our lads in the 2nd half and did well to prevent Tyrone going on to win it. Great block by young Lyons to save the day. Some excellent points by us in our purple patch before half time. At least we didn't concede 4-24,. If someone told me before Christmas that we'd be disappointed to draw with Tyrone, would beat Monaghan and coulda mighta have drawn with Mayowestros , would concede 2-31 in 3 games and would have an organised defensive structure.....I'd have said give me some of your tablets. Shows what happens when you have a Manager. 2 months of Cunningham - 3 years his predecessor. where's the heretofore ubiquitous Rossie? we got to a d1 semi with the predecesor. hopefully ac can do similar. Galway aren’t too shabby and have good forwards. Was it just me or did the Galway sub pick the ball clean off the ground for the goal? No semi finals now and wasn't that the work of a joint management team? i think Roscommon staying up this year will be a bigger achievement than 2016 when you consider the amount of last years panel no longer there or injured. Could have done with the two points today i feel though and won't get many better chances to beat Tyrone. League results are so hard to forecast,it is impossible to gauge a teams true worth.All teams are at different stages of training,I for one was not expecting a result against Monaghan who had beaten the dubs who thrashed galway.the rossi's on the other hand go out and beat Monaghan and were dissapointed with a draw against Tyrone.The dubs are hurting,they will probably still go on to contest the final with kerry or mayo. If we had gotten something out of that game, it would have been an act of thievery. Tragic mix up to allow the move for their goal. Yep we didn't deserve to get anything out of it based on performance, but we still had the opportunity, as bad as we were. The goal was absolutely criminal, have no idea what the defence was thinking. We were brutal the whole game, but if we hadn't fell asleep that one time we would have given ourselves a better chance. From beating the Dubs on day one, we're sucked into the relegation battle now, Omagh in 2 weeks is massive. Careful what you wish for Tubber. If Cavan could beat Roscommon and Tyrone beat Monaghan it would really make the bottom interesting! And then see if anyone has closed the gap. It's nonsense to say we're not trying in the league. But every Dub there was doing his absolute best as they know it's key to retaining their place come championship. It's nonsense to say we're less interested in the league than previous years just because we're going for the 5 in a row. We beat Galway comfortably (they play too defensive to cause up trouble) and it took really good performances from Kerry and Monaghan to beat us. There was been some commentary that we lost to Kerry because they are ahead of us in fitness. I don't know enough to say whether that's true or not, but in the last 10 minutes with us down to 14, we were the ones that finished the strongest. Kerry did look stronger and more athletic than in previous years. Their style reminded me of Mayo. Their defence looked much improved, and their scoretaking was a bit scary! As usual, Dubs look shaky defending a high ball. 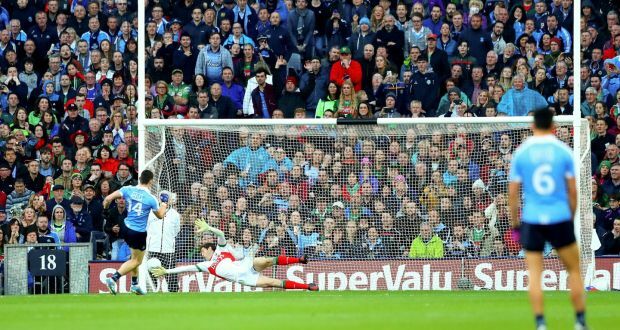 Dublin's star forwards Mannion, Con and Costello all had flashes of brilliance, but were inconsistent. Looking forward to Mayo now, and seeing what they're like this year in the flesh. If we beat them, and Kerry beat them, then we should be able to make it to a league final and give Kerry another go. But if Mayo beat us, then we are literally in a relegation battle! Although hard to see Cavan or Tyrone taking points off us. so you're writing off the the trip to the Hyde already?